Weeks ago, a fear about her daughters' safety in the face of a gun-happy society took hold of this mother. Then, in an instant, those fears came to life. 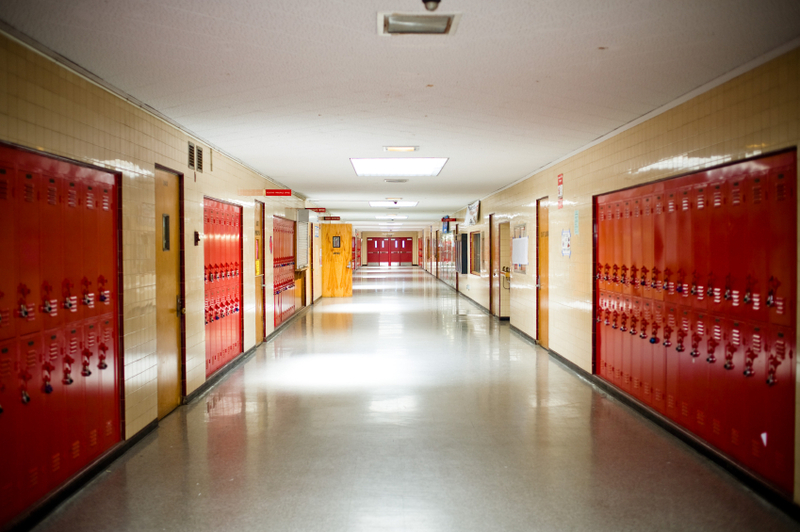 Editor's note: The timing and topic of this essay is prescient: As we prepared it for publication, the author's daughter's Seattle high school was placed on lockdown after a person was seen today on the grounds with a gun. As her teen-age daughter huddles in the auditorium with hundreds of her classmates, waiting for police officers with weapons to search the building and texting terrified parents on the outside, a previously imagined fear comes to life. 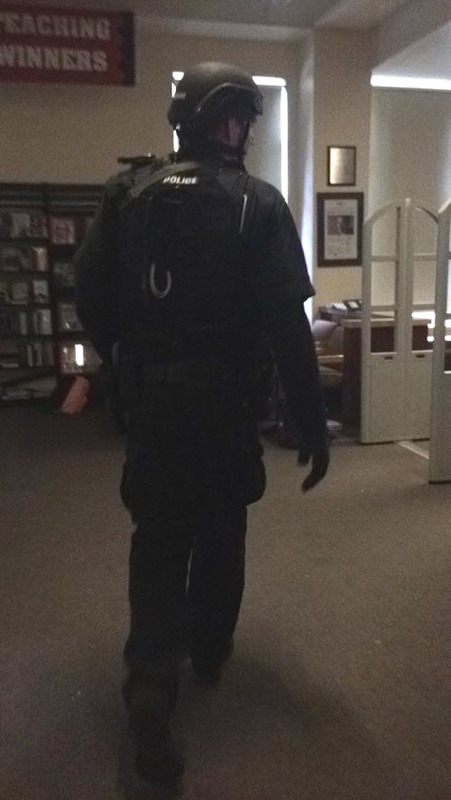 A police officer searches Ballard High School in Seattle. Photo: Taylr Scott. The first time it happened I was entering a crowded movie theater with my friend, her son, and my younger daughter. The “it” was an imagined mass shooting. The thought was a flash: What if a gunman were to open fire? And with that flash came an image of gunfire and people attempting to run. I followed up that flawed thinking with more false reassurance: We are safe because we are in downtown Seattle. My imagination profiles white suburbs, the very places that were depicted as bastions of safety in all the Bewitched and Brady Bunch I inhaled in the 60s. My imagination now sees suburbs as the scariest of places. I don’t want to admit this to you, but recently this same daughter I attended the rom-com with wanted to go to a certain suburban mall with a friend, a mall my imagination had decided is a place where a mass shooting could happen. I asked her why she wanted this mall over another suburban mall equidistant from our house in another direction. She said the bus routes were better and didn’t involve a transfer. This is the part I particularly don’t want to tell you: I asked her, “What if I drove you?” I later drove them to the “safer mall.” My daughter’s father later drove to the “safer mall” and picked them up. Currently, my daughter is sleeping downstairs and she is safe. Later today she will be at the local high school, a once ordinary place that now seems hazardous, a place that can ignite my imagination with fear. To highlight the insanity of this, I need to tell you that my older daughter lives in Chicago, a place my imagination has decided is safer than a suburban mall or my younger daughter’s public high school. Although I do worry about this daughter’s safety, I do not worry that she will be the victim of a mass shooting in Chicago. Of course, this is unreasonable. Of course, we know that it could happen anywhere. After the movie, I wondered why the what-if-there-were-a-gunman thought had come that particular day. It was the opening day of a long-anticipated movie and so the theater was full almost to capacity. Perhaps the crowding had lit up the fear section of my brain? The imagined image of a shooting was brief, and I was able to dismiss it. I dismissed it because we were in downtown Seattle (not a dangerous suburb!) and because the movie was a rom-com (not a dangerous action movie!). But this imagining marked the beginning of these random images of mass shootings that have scrolled unbidden through my thoughts. In a public setting, I have suddenly found myself thinking: What if? As a woman, I have long lived with the “what if,” but now a new source of imagining has entered my consciousness. Now that I have begun to imagine shootings, my imagination has fallen hostage to the terror of random violence, and I can’t help but wonder how many others have also fallen hostage. The rom-com our group went to see that July day was called Trainwreck. Six days later a man described as a “drifter” walked into a Lafeyette, Louisiana theater and shot two people watching this rom-com called Trainwreck. Later, the “drifter” shot himself, bringing the fatalities to three. The injured are always a separate total, a total we often ignore. I called my friend. “It could’ve been us,” I said. “It always could be us,” she said. Two months later, I am taking a group of writers to a writing retreat on Orcas Island. It is a beautiful and remarkably warm day at the beginning of October. Our spirits are high as we ride the ferry through Washington state’s stunning Puget Sound. Sunshine illuminates the blue water; dark green jewels of islands stud the horizon. We watch for whales. After we dock, we plan to meet for lunch in Eastsound, the hub of Orcas Island. One of the writers, a woman from Oregon, texts me as I’m pulling up to the restaurant. She writes that there’s been a school shooting in Oregon and that she needs to take some time to herself and will catch up with the group later. The phone that I receive the text on would easily allow me to search for the details of this shooting. I consider doing this search and quickly decide not to. I feel a familiar sense of fear for my daughter in Seattle, but I tell myself she is safe. She is in Washington, not in (dangerous) Oregon. She is not at her (dangerous) public high school this morning. She is at her writing class at a community college. I feel guilty that I do not Google the shooting for two days. I feel like I am a bad person, a person who wants to live in a world of beauty, art and safety and who wants to hide from the realities of life. I reason that I need to focus on the retreat. I am relieved that none of the other writers have brought up the shooting to me. But on the last night of the retreat, I go back to my room and search “Oregon school shooting.” While I’m waiting for the results to load, I realize the thing I’m most afraid to see is the number. I don’t want to know the number. I am afraid of the number. The number of Charleston was nine. The nine black birds flying above the white church in the New Yorker cover illustration are engraved in my imagination. As soon as I saw that illustration’s image, the beautiful black birds winging toward the sun began to repeat in my mind every time I thought of Charleston. The results load. The number is nine. Later the number will turn to 10. The setting is not a public school, as I had assumed. It is a community college. The setting for this mass shooting is a community college writing class. A few days later I drop off my daughter at the community college where she takes a yoga class and a writing class. In my imagination and in the world, my daughter is unsafe. Both my daughters are unsafe. Theo Pauline Nestor is the author of How to Sleep Alone in a King-Size Bed and Writing Is My Drink: (A Writer's Story of Finding Her Voice (and a Guide to How You Can Too). Her work has been published in the New York Times, WomansDay.com, the Huffington Post, Brain,Child magazine and more. An instructor for UW PCE's Certificate in Memoir program and Seattle's Hugo House, Nestor also coaches writers. Learn more about her at Writing Is My Drink .